DealerBuilt announces integration with UpdatePromise360’s Consumer Experience Lifecycle Solution, which provides a cradle to grave service offering. UpdatePromise360 solution has been adopted by 8 of the leading top 10 U.S. Auto Insurance companies and is approved by multiple OEMs for their integrated CSI services. The integration of the UpdatePromise360 Solution into the DealerBuilt Lightyear Management System user interface creates a seamless, fully integrated workflow. LightYear DMS customers will benefit from the ultimate consumer experience that only UpdatePromise360’s Consumer Experience Lifecycle Solution can provide. UpdatePromise360 will be available as a fully integrated Lightyear DMS solution in the first quarter of 2017. 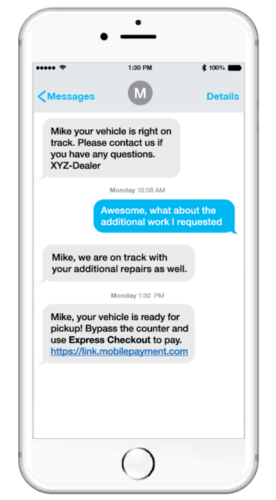 UpdatePromise is a leading communication and technology provider to auto insurers, repairers and dealerships throughout North America. Founded in 2009, UpdatePromise has communicated with millions of consumers and services more than 15,000 rooftops throughout the United States. For more information, visit www.updatepromise.com. Connect with us on LinkedIn and Twitter. Automated status updates ensure customers are kept informed during the service lifecycle. Reduce inbound and outbound calling between service writers and customers with real-time status updates via text messaging and email. Available analytics in real-time provide realistic target date and time on all delivery promises. Customers are able to schedule and plan their day more efficiently. Texting is 10 times quicker than phone calls – by the time you make one call to a single customer, texting would have enable an effortless communication with 10 customers. The essential truth about retaining customers is the way you are able to keep them engaged. As the old saying goes – the best way to grow your customers is not to lose them. Encourage the users to leave their e-mails. Let them know what kind of content they will receive. Put in some details about your campaign and list the reasons to sign up. Don’t forget the final call to action.